How big of a turkey do I need to make? What size of roaster will my turkey be comfortable in? In general, roasters with inside dimensions of approximately 16 x 13 inches will hold a 25 lbs. turkey. For example, the All-Clad roaster set with turkey lifters and a roasting rack. Smaller birds, 15 lbs. and less fit nicely into a roasting pan that measures approximately 14 x 10 inches. Some roasters, especially the big ones for 25-pound roasts, don’t fit into all ovens. Measure the interior dimensions of your oven, so you get a roasting pan that works for your dinner and oven! You also want to make sure handles are firmly riveted to the roasting pan. Stainless steel handles tend to be a bit cooler than cast iron handles, but in either case, be sure to use an oven mitt, since all handles, even those called “stay cool,” will get hot in the oven, too hot for hands without oven mitts! Be sure to think about the additional width handles add when you make your roasting pan decision. What type of roasting pan can help minimize splattering while baking or sloshing when moving? When cooking a larger roast or turkey, be sure the roasting pan sides are high enough, 2 ½ to 3 inches deep. But, be sure it isn’t too tall as they’ll prevent an oven’s hot, dry air from reaching the bottom of the bird or roast. Do I need a roasting rack? The roasting rack allows for heat to circulate around the turkey. Most quality roasting pans will include a rack as part of a set, but if you don’t have one, you can improvise with balls of aluminum foil or upside-down ramekins — as long as it keeps the bird from touching the bottom of the pan. 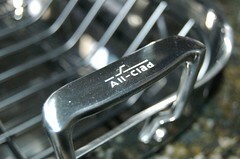 We also sell All-Clad roasting racks individually that may fit into your roaster. What else might I cook year round that would work well in a roasting pan? I don’t like to buy cookware that can only be used for one thing. Multi-functional is key! Lasagna, large quantities of macaroni and cheese, scalloped potatoes, green bean casserole, and so many more items work great in a rectangular roaster. I do like a non-stick roaster because of the easy cleanup. It can be used to cook so many more recipes, especially those with rich ingredients that are more likely to stick. 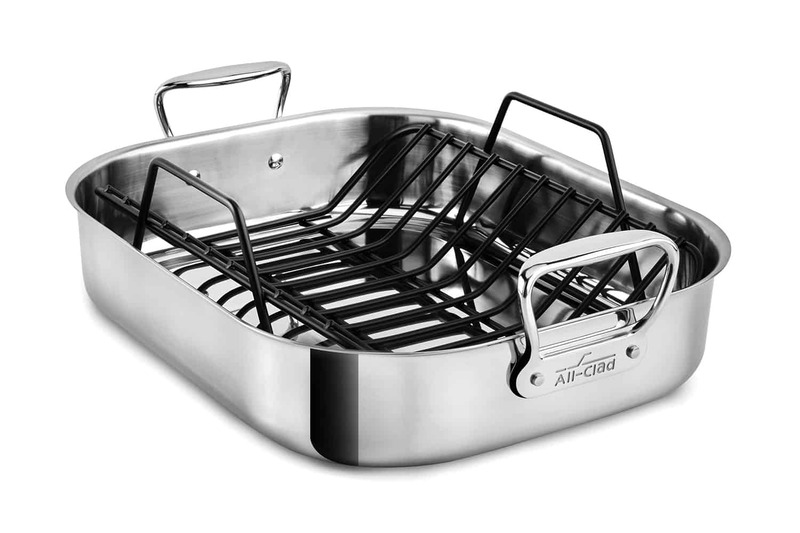 The All-Clad HA1 Nonstick roasting pan is a good choice. Is a copper roasting pan overkill? Copper is beautiful and is an excellent heat conductor, but is also expensive. However, one of the benefits of copper is that it cools quickly. The Mauviel copper roasting pan will cool more quickly after pulling it out of the oven than a clad stainless one. Can roasting pans be used on a stovetop? Yes! Just be sure to use it on a non-induction burner as most roasting pans are not magnetic and will not work with induction. If you’re looking for a roasting pan that can be used on an induction cooktop, look at the Cristel Roasting Pan. What are your roasting tips for Thanksgiving? Please leave them in the comments!